When you picture a classroom, what springs to mind? Perhaps a generously-sized room with large windows, rows of desks and chairs, a large whiteboard (or even a smart board) at the front. Probably not a box on the back of a motorbike, or a colorfully-wrapped van. But for the Agastya International Foundation, an organization dedicated to sparking curiosity and creativity in India’s children through science, the classroom is wherever the students are — whether that's in a fully-outfitted science center or a remote village (hence the motorbikes and mobile labs). 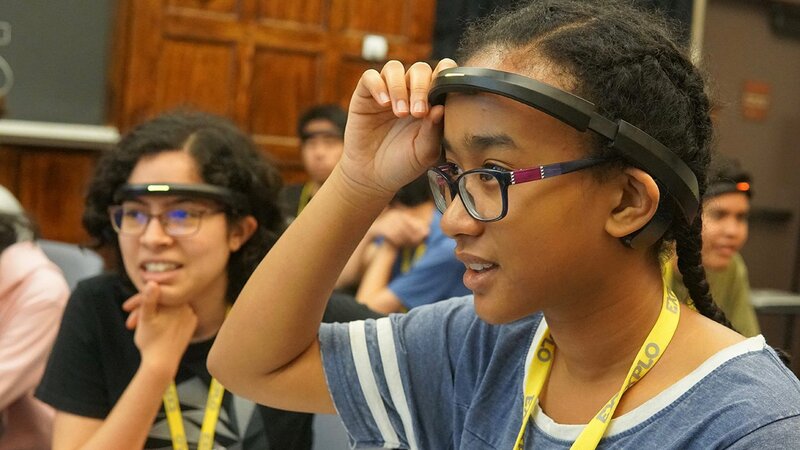 EXPLO recently had the opportunity to work with Agastya and its founder and CEO, Ramji Raghavan, thanks to a connection with Gavin Dykes — director of the Education World Forum who participated in an EXPLO workshop at the Oppi Festival in Venice. 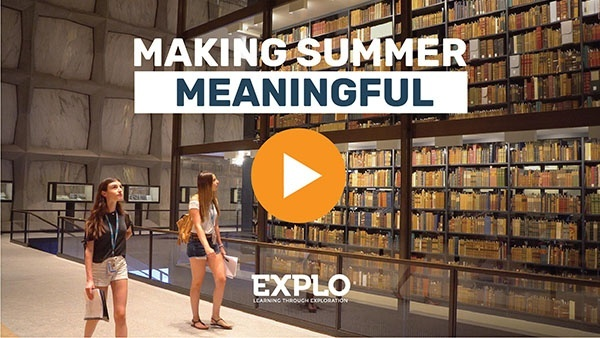 Raghavan and members of his leadership team visited the Exploration Center, EXPLO’s headquarters, and then sent another colleague to see EXPLO’s summer programs in action. What quickly became clear was that Raghavan’s vision for Agastya aligned with EXPLO’s take on teaching and learning. Discussions ensued about cultural appropriateness, scarce resources, and facility limitations, to name but a few. Q: Could EXPLO’s approach to curricular design and pedagogy work with economically disadvantaged students in India? A: The only way we’ll know is if we see Agastya in action. 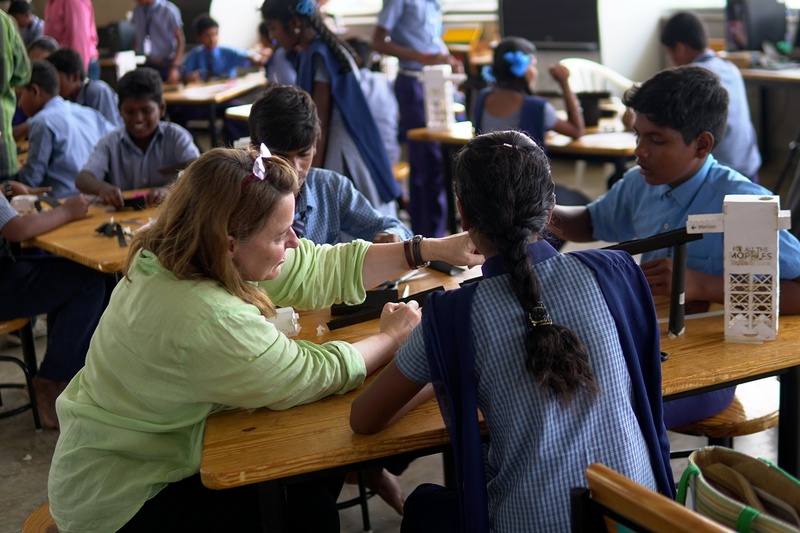 This fall, EXPLO President Moira Kelly and Creative Director Dave Hamilton spent a week in India to see Agastya in action. 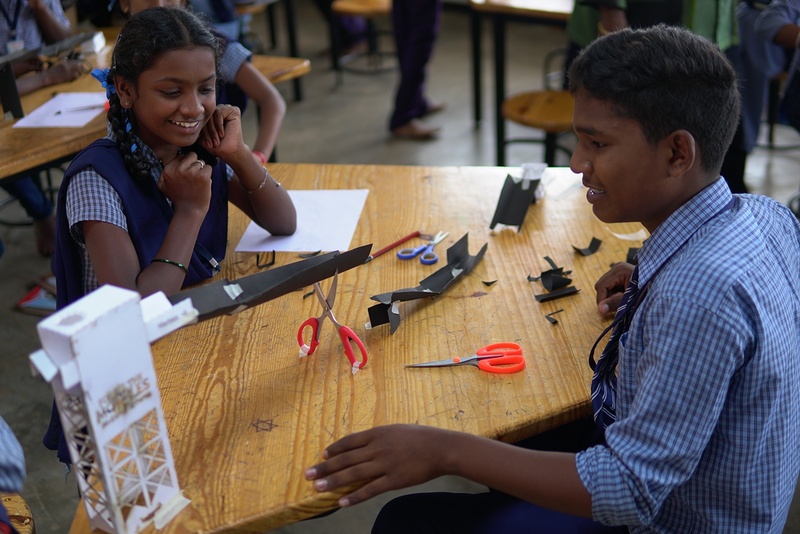 An 18+ hour flight and three-hour drive deep into the countryside of Andhra Pradesh took them to the foundation's main campus outside of Kuppam: 172 acres of classroom, studios, labs, and dormitories, set amidst farms and rice paddies. Agastya is a cause – not just an organization. Its vision is of a creative India. Its mission is ‘to spark curiosity, nurture creativity, and instill confidence‘ in economically disadvantaged children and government school teachers by bringing imaginative and innovative hands-on science education, project-based and peer-to-peer learning to schools, towns and villages across India. When the campus was first built in 2000, the land surrounding it was a rocky wasteland that looked like the surface of Mars. Over the last eighteen years, extensive ecological efforts have turned it into an award-winning nature preserve. Each day, hundreds of local school children are bussed there to partake in Agastya’s programming. During Hamilton and Kelly’s visit, government science teachers from all over India were on campus for a week of training. To take advantage of the EXPLO visit, Agastya modified its training schedule and had Hamilton and Kelly run a workshop. Because of the various languages spoken by the teachers, everything Hamilton and Kelly said had to be translated, which Kelly worried would detract from the lesson. But her fears did not materialize. The workshop conducted Moira and Dave can be summarised as LEARN TO PLAY & PLAY TO LEARN! It was so exciting as I watched the participants. I found it very hard to control myself. I wanted to play too! In the subsequent visit to the campus by these children they talked about the workshop and their learnings/takeaways. They had a hangover of excitement! Kelly and Hamilton spent time at all of the Agastya Labs as well as its Visionworks Division. They also observed its Mobile Lab in action at community science centers, along with evening peer-to-peer teaching happening in a village school. Like many schools, it had no desks or chairs. One of the takeaways for me is that kids are kids. Just like the teachers, a translator was needed, but that did not dampen the enthusiasm of the students. One of Hamilton’s fondest memories is of one of the translators. “I had asked the kids who had been actively building in small groups a solution to a problem. They were all working on the same problem, so they had put a lot of time and energy into this. I asked them to stand up and move two tables to the right, and then sit down and start working on that. You didn't need to be able to speak Telugu to understand that they weren't thrilled about that prospect, because they had put a lot of energy and work into their solution. They didn't want to give it up. Your insight into the minds of children and your passion to journey the children into curiosity and creativity is fantastic. I wish I had spent at least a year at EXPLO with you two during my childhood! Kelly says she was incredibly impressed by the culture of Agastya. “There’s a constant sense of experimentation and trying to do better," Kelly says. 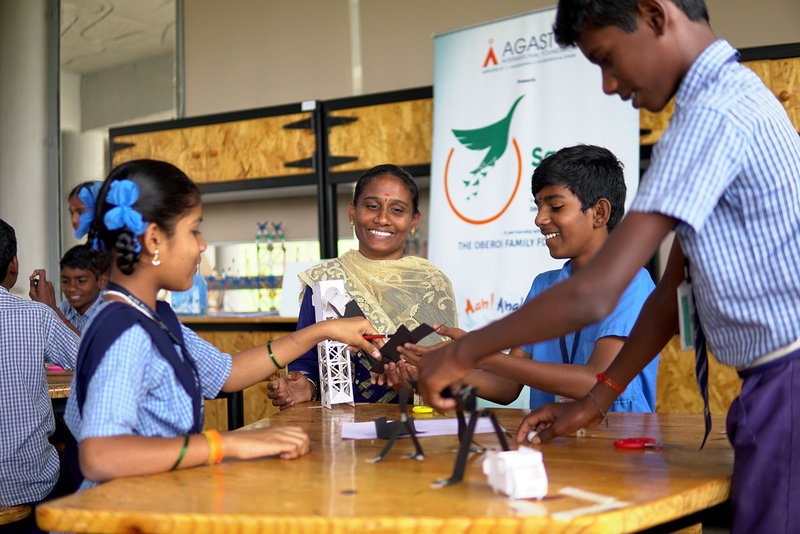 "Ingenuity is alive at Agastya and they simply do not allow a lack of resources to be something that prevents them from trying to take a step forward. 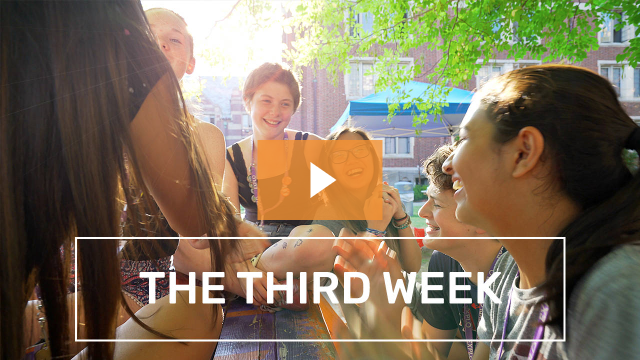 It’s a lesson that I’d like to infect every school and organization here at home." 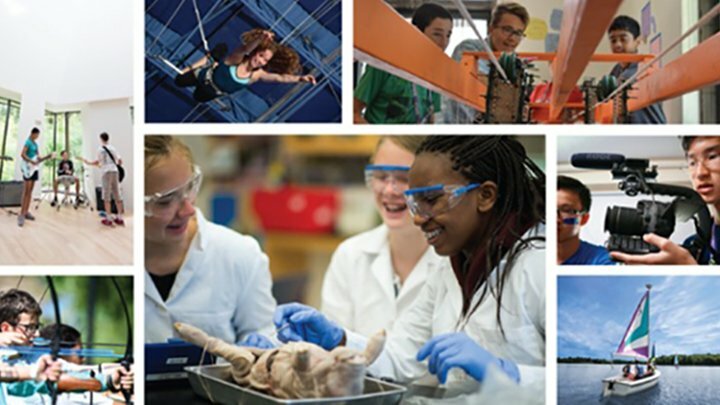 Several years ago, with four decades of learning through exploration and igniting curiosity under our belts, EXPLO's Board of Trustees issued a call to action to spread the EXPLO mission so that we could have a greater impact in the world of education. Kelly and Hamilton will travel to London in January where they will present at the Education World Forum. Photography by Dave Hamilton. Additional reporting and writing contributed by Sean Ryan.